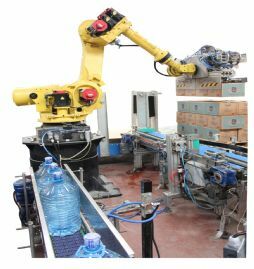 – Products from the line are transformed into layer in line with their array and in a form which robot can take, then sent in front of the robot. 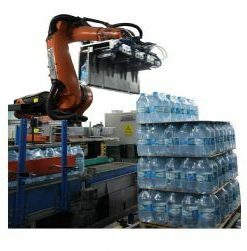 – Whichever product layer is first prepared, the robot takes that layer and puts in on the pallet. 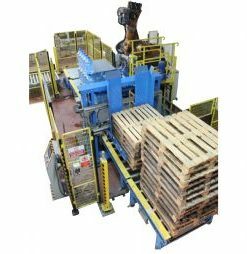 – Palletizing operation continues with this sequence..
– When creation of the layer is complete, a cardboard is interlaid.r. 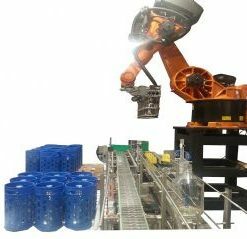 – Products are placed on the intermediate board again, and the loop continues until they reach the desired layer level..
– Once it reaches the desired layer, filled up pallet is ejected from the line. 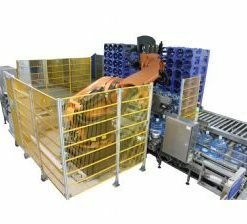 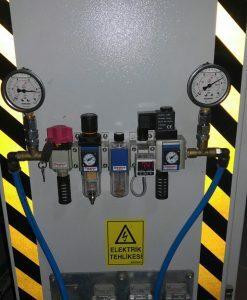 – More than one pallet application with a robot. 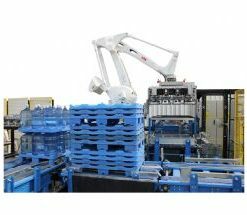 -Standard production and sales strength free from seasonal fluctuation. 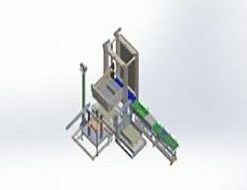 -Conveyors operating at ground level.